1 of 3 Heat oven to 350 degrees F. Line 15 x 11 x 1-inch jelly-roll pan with aluminum foil. 2 of 3 In large bowl, mix together turkey, mushrooms, yogurt, mint, oregano, lemon pepper and salt. 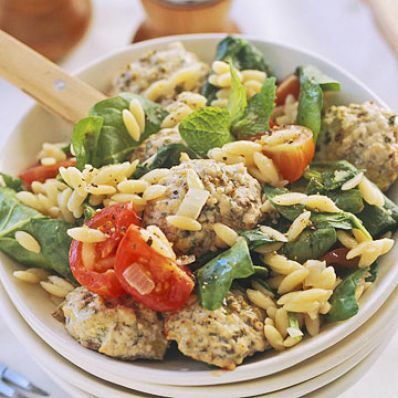 Shape into 28 meatballs, using 1 slightly rounded tablespoon for each. Place meatballs on prepared baking sheet. 3 of 3 Bake in 350 degrees F oven until browned and internal temperature registers 165 degrees F on instant-read thermometer, about 40 minutes. 1 of 2 While meatballs are baking, in medium-size saucepan, heat olive oil over medium heat. Add onion; cook, stirring, until slightly softened, about 3 minutes. Add garlic and orzo; cook, stirring, until orzo is coated and onion is softened, 3 more minutes. Add broth, salt and pepper. Simmer, covered, until orzo is tender, about 15 minutes. Stir in the spinach, tomatoes and mint; cook until spinach is wilted and tomatoes are heated through, about 1 minute. 2 of 2 Serve meatballs with orzo. Garnish with additional mint, if desired.